A lazy Sunday morning, I awoke having no idea I would visit this little town. 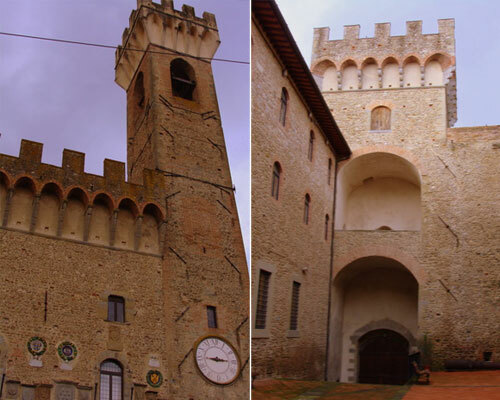 Scarperia was founded in 1305 with the name of Castel S. Barnaba. 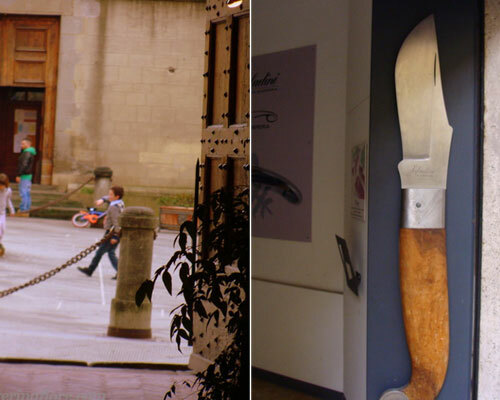 It is in the province of Florence and it the most famous for it’s workshops of handmade knives. When I arrived with a friend into Scarperia, it was like entering back in time. The historical center is still surrounded by a city wall and thus when you walk in you feel you entered into a different place. Along the main street, there were already a few speciality knife shops. We made our way to where the city hall sits. Palazzo dei Vicari characterizes the whole of Scarperia. The unique facade overlooks the main piazza. It is a normal looking residence but if you look at from the back it has the shape of a fortress. Inside the Palazzo dei Vicari there was evidence that this place could have been a mighty fortress back in the middle ages. Inside the Palazzo’s courtyard was an exhibit of old pictures of statues and plaques from around the city. Also a display case of the most famous knives. Consigli, Saladini, Berti are the three most famous brands of knives. Each has their own workshop where you can browse and even ask questions about how the knives are made. The Saladini cutlery shop is located on Via Solferino in the historic center of Scarperia. For many years there were many cutlery shops and now there are just a handful. 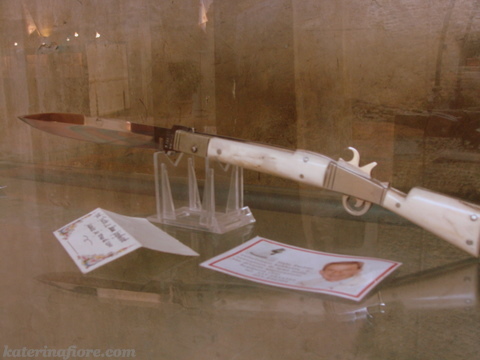 Saladini started producing knives in 1997 from the desire of Leonardo Saladini. They create very unique and innovative pieces with great taste. The brand Saladini stood out as a stylish brand with detail. An important step they took in revolutionizing the knife production process was creating a line of knives that has its own character with different types of material. 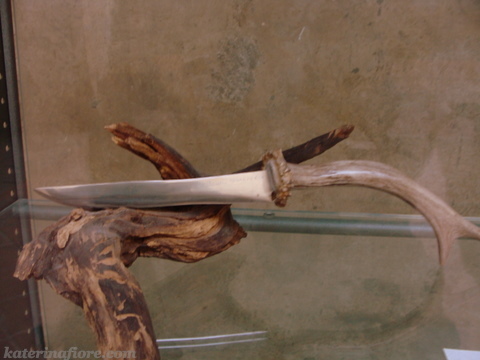 Consigli knives started business in by the hands of the brothers Luigi and Enrico Consigli. Opening their doors on Via Magenta in the center of Scarperia just about 50 years ago. Enrico and Luigi spent their time crafting many kinds of knives on behalf of their father’s company. By the 1950s, they partnered with a friend Marcello Azzini combining their last names to create ConAz. To diversify themselves from the Sardinian competition, they forged ahead in making more practical knives in the 1960s. Also adding prestigious knives such as pattada with polishing horn and mirror-finish blade. To shape the horn, they used furnaces rather than paraffin, thus causing the layers that compose it to become more compacted and reducing the possibility of flaking. That was always a common problem with knife handles. As these methods were handed down by generation with great care the children of Enrico and Luigi help the legacy of Consigli knives live on. Berti is the last of the more well-known knives of Scarperia. 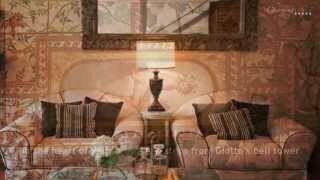 Located in the historic center on Via della Resistenza, Berti was started in 1895 by David Berti. Now for 4 generations they have passed down this tradition of hand crafting knives. The traditional way to make the Berti knives consist of using steel for the blades and using ox horn, stag horn and buffalo horn and “bosso” wood for the handles. The most important thing that needs to be done to consider it traditional is having it be started and completed by the same hands. “Our method means that each and every knife crafted is appreciated for the uniqueness of its character, given by the harmony of its form and the minute detail bestowed by its craftsman - making it a testimony to the Berti Tradition”(taken from the Coltellerie Berti website). I noticed how simple and quaint this town was. From the children kicking the soccer ball around in the piazza to the folk in the bar just calmly watching the Fiorentina game on TV. A calm, relaxing, country town with mostly families thrive with their traditions and their particular craftsmanship of historic knives. Are you fascinated by Tuscany and Italian traditions? Subscribe to our RSS, follow us on Twitter and Facebook and we’ll keep you updated! !